Magneto's plan for his team of X-Men takes a turn when he proposes a partnership with the Hellfire Club. 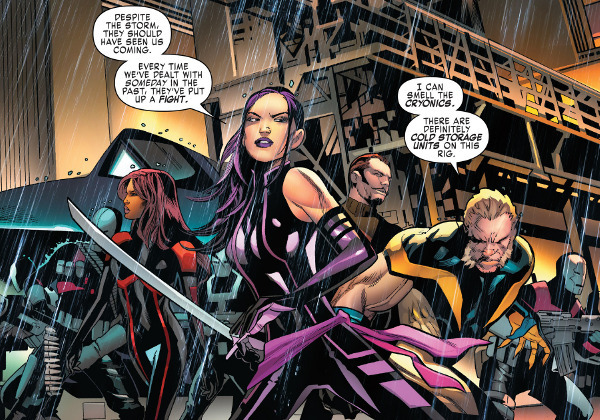 Psylocke balking at the idea of joining the Hellfire Club also leads to a flashback of Magneto recruiting Betsy as the most unlikely member of his team of X-Men. From Magneto's perspective a partnership with the Hellfire Club makes perfect sense as his larger plans for mutants call for all the allies the master of magnetism can muster. Like Psylocke, I've never been that big a fan of the elitist club of kinksters and mutant aristocrats but reintroducing them here as potential allies makes sense (while also questioning just how reliable or useful these new allies truly are). On the flip side teaming up with the Hellfire certainly seems to push Magneto's team out of the gray and firmly in the villain column. I've been in and out of the series since it was relaunched. Because of this I'm a bit confused as the exact nature of the Corporation the team is up against (or what their ultimate plans for mutants is). Better understanding this might sell Hellfire Club as allies the X-Men could use, but in the end I'm much like Psylocke questioning whether or not this is the best the X-Men can do. For fans.